Alice in Wonderland is director Tim Burton's take on the classic tale, and it is all that you would expect from Burton visually. I loved the color pallete of pastels and muted tones with bursts of eyepopping color throughout. Alice has been having dreams of “Wonderland” since she was a child. Now as an adult the White Rabbit has returned for her to defeat the Jabberwocky and save Wonderland from the Red Queen. Mia Wasikowska's portrayal of Alice was the perfect balance to the trio of Burton, Johnny Depp and Helena Bonham Carter. She kept the movie grounded and gave me someone to root for when it could have easily gone way over the top. 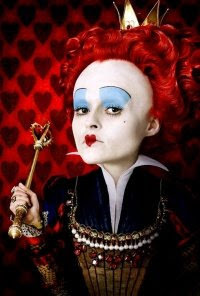 I'm not a big Helena Bonham Carter fan but I loved her as the Red Queen. First of all, you cannot stop laughing at that emormous head! but she also added a surprising depth to the character and I felt a lot of sympathy for her. Johnny Depp was surprisingly bland and I couldn't understand what he was saying most of the time. I also didn't think he had much chemistry with the other actors. As you would expect this is mostly a special effects movie and there is a lot of CGI used to varying degrees of success. One of the worst uses is with Stayne (played by Crispin Glover). His head is real but his body is CGI and his movements are very choppy. I'm still unsure of why they felt the need to use CGI for his character. Another example is with the horses...again, I'm not sure why they even used CGI for them except for when they talked. Overall a fun movie......gorgeous to look at. It seemed like they attempted to flesh out a story but I just wasn't feeling the connection between the characters with the exception of Alice and the Red Queen and Stayne. Note: I didn't see this in 3D so maybe the effects would be better in that format. Rating: 3 out 4 Not perfect....but fun! See it on the big screen. Nice review, I have thought about watching this before because each rendition of the show is always different. I didn't even think about it being an actual sequel, that really intrigues me. I know you talked about the characters but what of the actual plot, was it worthy or was it more of what you expect from a sequel? I don't know,I guess I will have to rent it sometime. Personally, the movie Alice that played on scifi was my absolute favorite. Even if it wasn't the same Alice, I loved Wonderland in it and the new twist they gave it. Whenever Johnny Depp is in a movie it kind of becomes about him... but this has a fair amount of plot - not too deep though. The girl who plays Alice is so good that it overcomes a lot of the problems with the movie. Helena Bonham Carter has a very nice storyline too. Definitely worth renting.